A man who invented the cooling cap, which can be used by cancer patients to help prevent hair loss from cancer treatment, has made a list of six inspiring people that Michael Hayman, the co-founder of StartUp Britain, has credited with “changing lives”. Glenn Paxman was inspired both by his father Eric, who created the beer cooler, and his wife Susie, who sadly passed away from cancer at the age of just 34. Seeing how devastated Susie was when she lost her hair during chemotherapy, Glenn went about finding a way to prevent other women having to go through the same ordeal when tackling their illness. True to his word, the first prototype of the cooling cap was made available at the Huddersfield Royal Infirmary in 1997, and Paxman Coolers, Glenn’s company, was formed in 1998. Based on the fact that 8 per cent of women with cancer reject chemotherapy because they don’t want to lose their hair, Glenn’s innovation could be said to be lifesaving, as well as a welcome relief for many women concerned about hair loss. Around 70 per cent of patients who use Paxman’s systems do not need a wig, and Paxman has helped many thousands of cancer sufferers in Europe, the Middle East, Asia and South America. He is now expanding the business into the North American and Japanese markets. Hair loss from cancer treatment cannot be treated using a medically-based hair loss treatment plan. However, this type of hair loss should always be temporary, and hair should begin to regrow in the months following the end of the treatment. For women whose hair has failed to regrow to its previous thickness, it may be that the onset of female pattern hair loss has been triggered by the illness or its treatment, or has coincided with the hair loss from cancer treatment. Hair loss in women that is due to genetics can be treated with minoxidil, a topical treatment that is best used as part of a hair loss treatment plan that contains a variety of treatment boosters to ensure overall hair health. 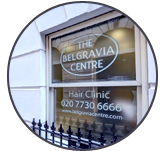 Regular clinical monitoring also ensures that treatment is progressing well, and Belgravia clients often find that where hair loss is particularly stubborn, a recommended high strength minoxidil product available from the range at our in-clinic pharmacies can help.